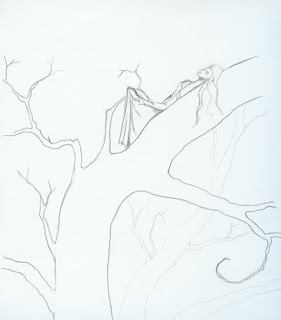 This is the initial sketch of the next watercolor that I am going to attempt. I can not take credit for the idea or composition. This is from the Dreamscapes book that I was talking about the other day. This is one of the lessons. I don't know if I will be able to work on this tomorrow or not, likely it will have to be this weekend. With any luck, I heave learned enough from my mistakes in the last couple of watercolors that I can actually make this one come out looking nice. At least, I am going to give it my best shot. I will let you all know as soon as I get it finished.